Top 14 Blog Posts in 2014! 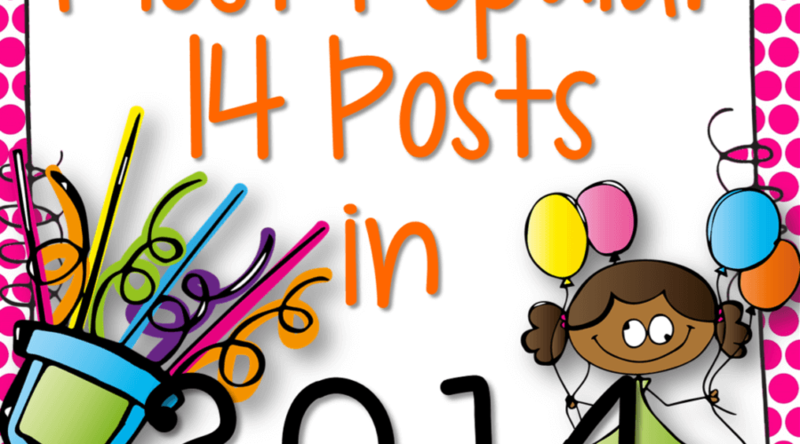 I’m joining Jen over at Teacher by the Beach in sharing my 14 most popular posts of 2014. Here is a countdown to the top 14 most viewed posts over here on Dragonflies in First in 2014. Did you miss some of them? Click the titles to visit the posts. Bossy R & the Diphthongs! I ♥love♥ that this was popular with all of you readers. It is one of my most favorite resource titles ever! Another passion of love for me! The Morning Wake Up morning work series has become a teacher favorite. I couldn’t be more thrilled. Whoa! That title was a mouthful! I still can’t think of a better way to explain these useful and important learning tools. Teaching kiddos in the most meaningful, fun ways ensures your day goes better, too! Such a difficult concept for firsties! Editable, simple and purposeful… Oh, and FREE! Again… editable, simple, purposeful! A Back to School MUST! We sure are busy with our word wall! I seriously CANNOT recommend this amazing rug alternative enough!! I absolutely adore how much those lovely removable and cleanable spots transformed my room! I love that this blog provides me the opportunity to share amazing finds with other teachers. I use this quick and easy technique a lot. It’s a time (and paper) saver! Planning is near and DEAR to my ♥. I could (and do) talk about it for hours on end. I honestly feel all curriculum planning MUST begin with a year plan. Another quick, easy, effective, simple and FREE set of tools! When working with small groups or individual children, the interruptions from the rest of the students can hinder all kinds of learning. This is how I keep those interruption to a minimum! This MOST viewed post for 2014 is something I *preach* about constantly. ORGANIZATION is critical and I honestly believe this is the first step in getting your classroom materials and teacher brain in order. So that sums up my 14 most viewed posts in 2014. It’s difficult for me to pick a favorite, but 14, 11, 4 and 2 are definitely at the top of my favorites list. ah! So many good posts I missed the first time around! I really enjoyed looking through these! There were some I missed. Thanks! Thank you for the progress report freebie and the post on kinesthetic math. I'd missed those. Have a happy new year!